Did that work and install the latest version? You usually don't do it manually because your package manager (by default) periodically does checks for updates (i.e., it runs apt-get update which refreshes the indexes of the repos given your sources.list to identify updates). I know Ubuntu bugs the hell out of me by saying I have updates every day I need to look up (which amounts to clicking "okay" to update). Yeah it did. My manager hasn't been much of a manager in this respect. Im not sure if its a bug in Mint 13 or if I havn't configured my settings correctly. There is finally a reliable workaround to get Netflix Instant Streaming to work! It looks like right now it's only easily done using Ubuntu but I know I read something somewhere that implied to me that one could implement the same things in this workaround on other distros - it's just not as nicely packaged right now. Has anyone tried the conky manager app? Looks cool. Its pretty quick and easy, not sure how flexible it is compared to using command line. Looks interesting. I spent some time making a functional but not too pretty conky configuration. This looks interesting to me. I'm downloading it now. Cool. You should also get the deluxe theme pack. has some pretty cool looking configs. Think about if Linux was the most popular operating system in the world. I understand the individual who claimed to have trouble switching from Windows to Linux; see, I felt the same when I switched to Windows for the first time. I decided to try it after a few friends told me it was really good. I went to Microsoft's website to download it, but it wasn't available there. This is confusing; how would you get it if not from their website? I resorted to asking a friend, and he told me I had to buy it. So I got into my car and drove down to Staples. I asked one of the sales representatives there if he could help me, and he showed me the options. Obviously I wouldn't want to hurt myself by getting an incomplete copy, so I asked for the one with all the available features. "That'll be 600 euros." he said. **** that. Empty handed, I went to my friends. One of them gave me a copy of Windows XP, but since it was illicit he told me to keep it on the down-low. How weird; with Linux, you are encouraged to share your software with everybody else once you're done with it. Oh well. I put the CD in and waited for the desktop to boot up. But it never did. The only option it gave me was to just "install the software". I called my friend thinking I messed something up, but he confirmed that Windows does not offer a LiveCD environment. Wow. I guess I'll take the plunge and just install it. I followed the instructions on the screen, but not once did they even adknowledge that I had Linux on my system already, and I may want to install Windows alongside it. Linux would, of course, do this every time. I called my friend again, and he confirmed that Windows doesn't play well at all with other operating systems. Unphased, I backed up everything I had and prepared to just erase my Linux installation. The rest was pretty easy until I was asked to enter a bunch of letters. I, again, called my friend, who came over to enter the product key for me. He reiterated that I can't tell anybody what we're doing. Finally the installation was complete and I took a look around the computer. I noticed that I had full access to every setting in the control panel without any ownership authorization. I asked my friend about this again, and he said that root access is given to you at the start. Always using a root account in Linux is a really bad idea, so I decided to just create a normal user account and use that. But when I tried to modify settings with that account, it didn't prompt for my administrator password or anything; it just wouldn't let me change them without entierly switching my account. Anyway, I had some work to finish. I open up the start menu and try to open up a spreadsheet-viewing application, but there's none to be found. My friend said that Windows doesn't come with one, and I'd have to download it. Well that's certainly acceptable, probably to cut down on the OS installation size. I click on "Add/Remove programs" in the start menu, like in Linux, but it didn't say anything about adding programs. Just removing them. My friend said that I have to find the applications myself on the internet. With a bit of Googling, I found OpenOffice.org. To be honest, I had fun braving my way through Windows. I didn't understand a lot of the terminology (why do the drives have letters attached to them? what happened to drive B? ), and the OS seemed to be too basic at the start to get any work done. My friend also mentioned that I'd need AntiVirus and AntiSpyware, because Windows doesn't come with any. The entire experience was just too confusing and stressful; maybe it'd be good for somebody with more knowledge of technology, but I'm satisfied with Linux. Thanks. I recently noticed that default options in Ubuntu/Linux is one of the reason for taking lot of RAM spaces. By searching I got an efficient way to handle the RAM usage. Reboot your Linux and it will run much faster! 2) How do I configure swappiness? 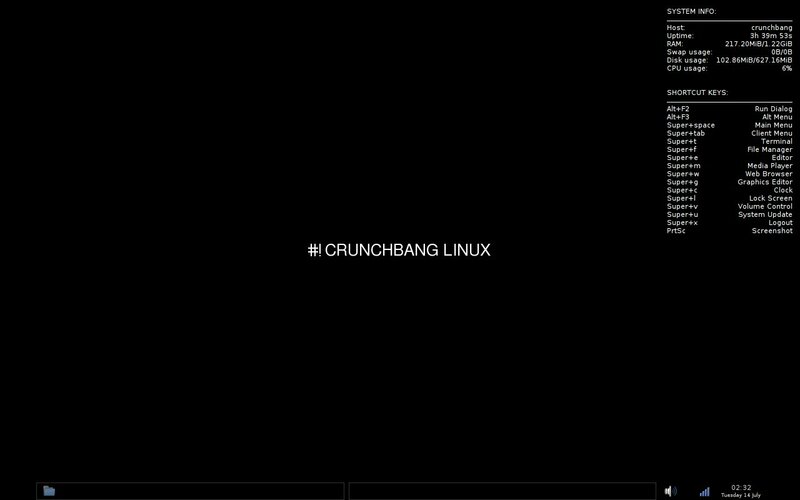 Just distrohopped from Ubuntu to crunchbang (#!). It's great, 70 - 80 mb ram usage, debain packages and superminimalistic openbox wm. As of April my Linux Mint version is no longer suppported. My recent experiences with Arch (thanks TE and Dason) and Archbang made me a huge fan. However, becasue Im a sucker for Gnome / MATE I was undecided what to do until I read an awesoem review of Manjaro - now with MATE and Cinnamon community releases. Manjaro is alright - but why exactly wouldn't you just go with Arch + cinnamon (or MATE)? They're both supported in Arch. I've used cinnamon in Arch before and it worked quite well. And not that I would suggest going with something else over Arch but you could just upgrade to the newest version of Linux Mint. The next 3 releases after 17 will also be built on Ubuntu 14.04 so you will have an easy upgrade path if you want. Laziness I guess. I like the idea of having all the installing bits for me. I did not know that. Any idea which will be the next LTR? I think the current one for Mint is version 13. This next one - Mint 17. There are release candidates out for the Cinnamon and Mate editions out right now. Elementary OS (http://elementaryos.org/) seems a good choice. This has been a pending item in my deleted distractions. ElementaryOS is pretty nice. When the next release comes out I'll give it a try in a live environment. Pantheon is shaing up to be really nice. My current xfce setup is similar to the elementary layout. I'm going to try DSL, and test it on an old laptop I want to use for various live monitoring projects. I gave OpenSuse a try for a day. It was actually pretty nice. It does a really good job of giving a nice integrated environment that looks clean . But I went back to Arch. I haven't found anything better than Arch. And its wiki is just ... superb. It can be anything you want it to be. You want the latest greatest bloated gnome desktop? You got it. You want a lean slick xfce environment? You can have that too. Pacman is just an excellent package manager. Honestly I like apt based distros but they have nothing on pacman. And configuration is just as simple as editing text files. Dammit - I should watch Her because it might be based on my relationship with Arch.